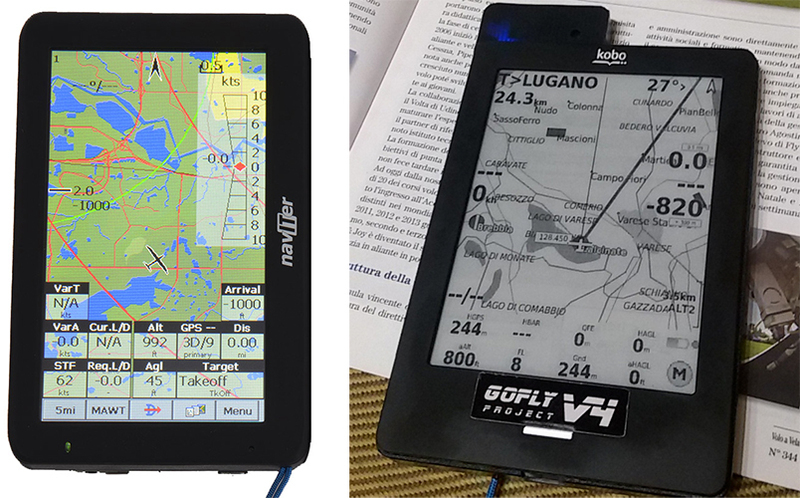 One of the most useful tools in CX paragliding is the variometer or vario for short. The amount of technology and features that are available in modern vario is staggering and can be confusing to potential buyers. If you have ever shopped around for a vario then you have most likely been overwhelmed by all the features and terminology used in the manufacture descriptions. This article is going to simplify some of the most useful product features and terminology used to describe whats under the hood of these flight instruments and hopefully streamline your shopping experience. Generally variometers will fit into three categories. First, audio only varios will beep when you go up and make a low groan when you go down. They don’t have a GPS or a screen to tell you what is going on, they are simple, lightweight, and less expensive than other types. The second types are variometers with a GPS. 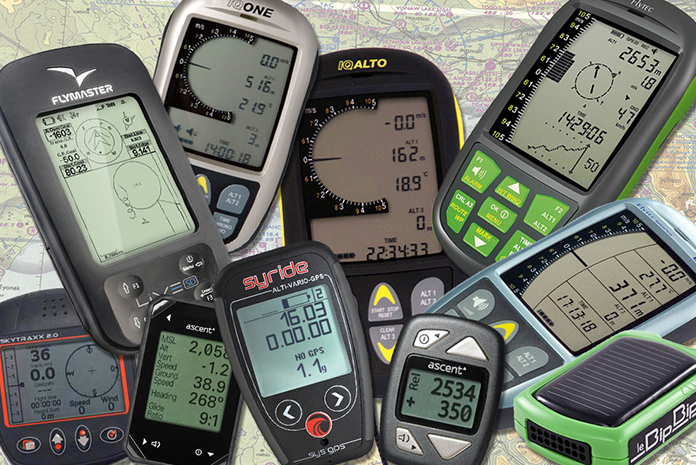 GPS Variometers give you basic navigation information such as ground speed, glide ratio. Some Gps varios might include airspace and basic routes. Finally, we have advanced or competition type variometers. These do everything except fly for you and they can have complex features. When choosing a vario there are some features that you need to understand and decide if you are actually going to need for your specific flying style. If you are short on funds and never want to compete or brag about your flights with your friends, then go for a simple and cheap audio only vario. If competing and going far is your thing, you will definitely find a lot of value the additional features that are available to you. This is obvious right? A vario with a GPS will help figure out where you are and how fast you’re going. Personally, I feel knowing what my ground speed is, is really important when you are flying XC or at a windy ridge. Knowing your ground speed could be the difference between not getting blown back or making an extra 10 miles over the duration of a flight. A few variometers have detailed maps that enable interesting functions. With terrain information a vario can figure out your altitude above the ground. You can use maps to find a a road if you land in tiger country. Detailed terrain maps can help you make decisions on long XC flights or race to goal competitions. This is one my favorite features and different manufactures do different things. Flytec uses an arrow to point you back to the best lift you have been in. 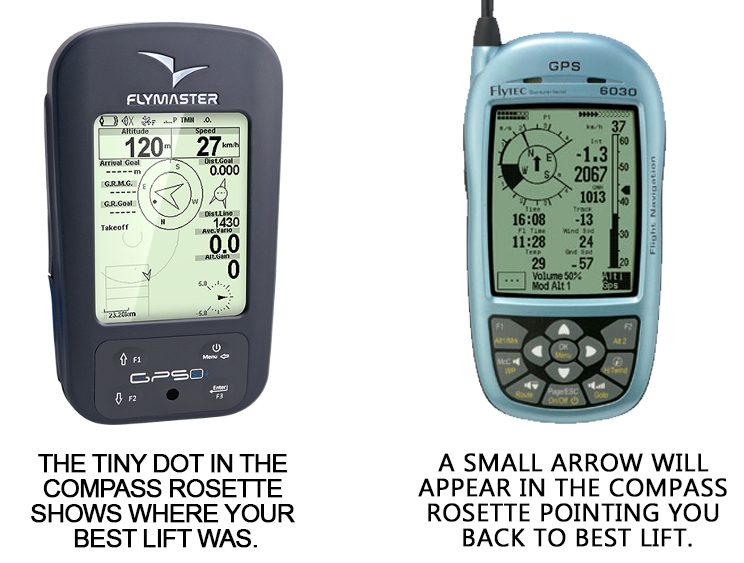 Flymaster uses a “magic dot”, which is a small dot in the compass rose that indicates where the best lift was in relation to your location. The Oddie uses a snail trail with dots and different colors to indicate best lift.There are numerous variations on this and the majority of them work fairly decent to locate lift if you have lost it. Most varios make two basic noises, a high pitch if you are going up and low buzzer if you are going down. Some varios introduce a third sound to help you locate light pockets of rising air. They do this mostly by making growling or clicking noises when your glider is neither rising or sinking. We call this being in “zeros”. The idea is if your glider is always going down at 1.1 m/s and your vario is telling you that you are neither going up or down, you are in rising air. The air isn’t rising fast enough to help you go up; but usually these areas turn into something more if you are patient. The more complicated varios will show a map with the airspace on it. They will also give you audible and visual warnings if you might violate the airspace. If you live in an area that has complex airspace near your flying spot, you should seriously consider a variometer with this feature. This is the basic feature you need to do competitions. With routes you can set a race course in the sky using turn points. Cylinder sizes allow you to put an imaginary cylinder around a turnpoint. Most, if not all competitions use cylinders in a task. This feature is really neat if you plan to do competitions. What it does is get you to your goal faster. So how does it do that? When you fly competitions you fly a course that is defined with a point surrounded by a big circle or cylinder. If you are flying along and can clip the side a cylinder closer to you next way point or goal, you can save miles and time. Now that we have covered the basics of the beepy things we need to answer a few important questions. Will flying with a GPS/Vario make me a safer pilot? The General answer is yes it will, for a couple of reasons. Knowing your ground speed is super important when you are flying a windy site. If you see your ground speed go towards zero, you know you need to start thinking about an escape plan. Flying backwards is seriously not cool or fun, unless you meant to. Having access to maps and airspaces can help you be more aware of your surroundings, which is a good thing. The part that goes bad with flying with a GPS/Vario is if your head gets stuck only looking at the numbers and not being aware of what is going on around you. Will Flying with a GPS/Vario make me a better pilot? This is a huge yes/no answer. Yes, it will help you make better decisions flying XC or Comps, that is it’s job. No, it won’t tell you to avoid huge cumulonimbus that is developing in front of you. A GPS/Vario will tell you have a four to one glide ratio to goal; but it won’t tell you that you might fly through rotor getting there. A Vario will tell you immediately if you are in lift; but it won’t tell you where that lift is when you are searching a new area (unless you have some thermal maps loaded, but that is another story for another day). I have flown paragliders for a number of years and love to geek out on these techy toys. So what did I use for some of my most favorite and memorable flights? I used nothing! This is free flight after all! These tools do have a place and I think it is important to understand that when used in the right circumstances they can be a useful tool that will expand the horizons you get to see. Jonathan Foster has been intrigued with flying and non-powered flight since he was young. As a child it started with remote control sailplanes and in adulthood grew to private aviation. In 2008 Jonathan discovered paragliding and hasn’t been back in the left seat of a Cessna. Intrigued by technology Jonathan has become an expert in free flight avionics. When Jonathan doesn’t have his head in the clouds he spends his time with his family; two children and a wife who is an elite triathlete. Professionally, Jonathan works for the State of Utah as a technology architect and engineer.